The World of Asphalt Show and Conference and AGG1 Academy & Expo 2016 are on track to be standouts with advance registration for the exhibitions and education programs tracking far ahead of past shows, and a record show size. “These are our industry shows, and industry networking to build connections, share perspectives and find industry solutions is one of the most valuable aspects, reaping benefits long after the shows close,” said Rick Moore of Lehman-Roberts Company and World of Asphalt chair. The events will be held March 22-24, 2016 at the Music City Center in Nashville, Tennessee. 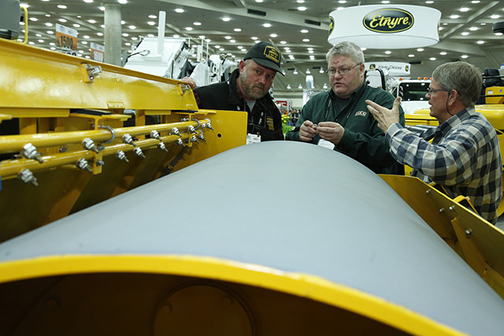 The shows target the business and professional-development needs of aggregates, asphalt, pavement maintenance and traffic safety industry professionals. Attendees can make the most efficient use of their time onsite by using the interactive online exhibitor directory (with show map) to create a personalized itinerary pre-show. The directory is searchable by company name, companies new to the show, type of product or market area, geographic location, booth number and location on the show floor. The World of Asphalt and AGG1 mobile app has increased capabilities for the 2016 shows to help attendees plan and manage their time onsite, and stay up to date with real-time alerts. The show app will also support social media feeds Twitter and Facebook. The free app is synchronized with the full capabilities of the AGG1 and World of Asphalt online exhibitor directory and show planner. The show app will be available in late February or early March. Check the show websites for details. Register for the show in advance to save time and avoid lines worldofasphalt.com and agg1.org.